The Stanley Cup Final between the New York Rangers and the Los Angeles Kings begins tonight. 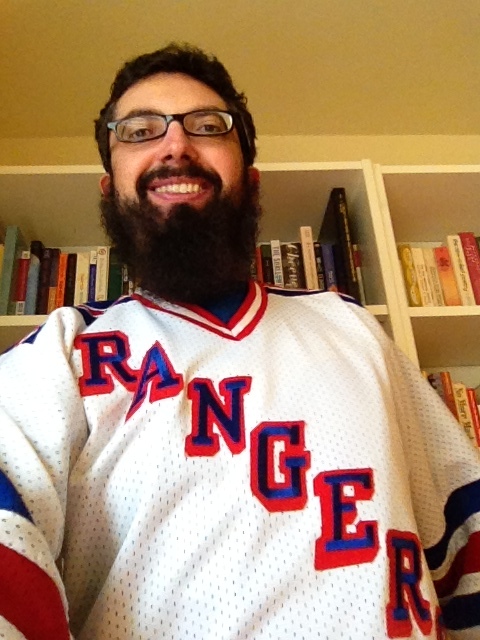 I’ve been a Rangers fan since 1990, when I decided to root for them in their first-round playoff series against the Islanders. I began following the team closely during the 1991-1992 season, Mark Messier’s first with the team, as they won the President’s Trophy before being shocked by the Pittsburgh Penguins in the second round of the playoffs. Most hockey fans are familiar with Rose’s call now, as it gets replayed every time the Rangers have a big playoff game, and it is one of the greatest North American sports announcing moments ever. But what gets forgotten, and, in hindsight, what was terribly unfair to Rose, is that the Rangers decided to let their long-time play-by-play man Marv Albert announce periods one and three of games 5 and 7 as the team tried to win the cup on home ice, with Rose doing period two. Now, Marv Albert is my favorite announcer of all time; he is the best basketball announcer of all time and is quite a good hockey announcer (much better than his younger brother Kenny, who absolutely murdered this year’s Western Conference finals for NBC). But it seems cruel to have taken this moment away from Rose, though now he’s an announcer for the Islanders, so who cares, I suppose. My family moved away from New York a few weeks later, and though I continued to root for the Rangers, it was never the same. I couldn’t listen to the games on the radio, and had to be content to catch a game whenever the Rangers were on nationally on ESPN or Fox with that ridiculous highlighted blue puck and stupid scoreboard robots (which Fox still uses in their NFL telecasts! Unbelievable.). I would always watch the Rangers in the playoffs, but without the bond that gets built up over a long season the games never felt nearly as life-and-death as they did in ’94. As I grew older, baseball reasserted itself as my favorite sport and soccer became a close second, and now I follow the Mets and Manchester United with the same day-to-day devotion that I used to give to the Rangers. I’ve become closer to the Rangers now than I have been in years because I live in New York again, and I get MSG so I can watch them whenever I want, but I also know that I will never love them as much as I loved them then (a horrible admission, I feel dirty all over putting it in words, but it is the truth). In reality, all of my interactions with the Rangers since the mid-1990s have been a form of nostalgia for the 1994 team, an attempt to get back to those feelings of sheer joy and wonder. Nevertheless, as the finals begin tonight, I’ll be rooting hard for the guys in blue, red, and white, and hoping that they will create some unforgettable triumphant moments of their own. Who will be this year’s Stéphane Matteau? Which save by Henrik Lundqvist will be remembered like Mike Richter’s save of Pavel Bure’s penalty shot in game 4 of the ’94 finals? (You can see video of it here. I love John Davidson’s reaction when the penalty shot is called: “Get your cardiologist!”) And most importantly, whose smile will be as big when they lift the cup as Mark Messier’s was when he held it high in front of all those screaming fans at the Garden? Lions, Bernard. 1000 Football Shirts: The Colours of the Beautiful Game. 2013. New York: Universe, 2014. One thing I love about football (i.e., soccer) are the uniforms, and I have also been obsessing about the sport even more than usual lately because of the upcoming World Cup, so when I found out about this book I bought it immediately. It is difficult to find good books here in the U.S. about soccer, so I am especially attracted to books such as this that attempt to offer comprehensive histories of various elements of the game. I will begin reading the book this afternoon, but I must note that I am immediately skeptical of it after looking at its cover. There are 130 shirts total pictured on the front cover, back cover, and spine, but none of these are from the biggest club in the world, Manchester United. There are two Liverpool shirts, a Chelsea shirt, a Manchester City shirt, an Everton shirt, and eight shirts from MLS (including the LA Galaxy home shirt twice, along with their change strip: blatant proof of David Beckham’s continuing commercial power). I love MLS, and I like Everton because I hate Liverpool, but there is no way that any of these nine shirts are more important than Manchester United’s. This is a ridiculous omission which makes me question the biases of Lions and his publisher’s designers. I hope that the text itself meets a higher standard. Slocum, Frank, and Red Foley. Topps Baseball Cards: The Complete Picture Collection: A 40-Year History, 1951-1990. New York: Warner, 1990. I collected baseball cards seriously as a boy between 1987-1990, and always preferred Topps over Donruss or Fleer. While I am no longer an avid collector, I will still buy a few packs (always Topps) every once in a while for nostalgia’s sake, and I buy a Mets team set each year. As a result of this fondness for the hobby, I have had my eyes on this book for several years, and finally found a copy for a reasonable price. It is much larger than I expected, which is exciting; I can understand why it was so difficult to find a copy for less than $50.00. Both books were acquired from amazon.com’s network of independent sellers. Manchester United’s bizarre, disappointing season ended today with a 1-1 draw at Southampton. Ryan Giggs coached his last match as interim manager, and it is a good bet that his substitute appearance in the last home match earlier this week was his final one as a United player. Giggs has had a tremedous career since his debut in 1991, holding the club record for appearances and winning two European Cups and numerous league titles and domestic cups. He scored in every season of his career prior to this one. It is difficult to write about his career simply because it was so successful; had you made up a fictional character with all of Giggs’s accomplishments before he came along no one would have found it credible. He is one of the sport’s all-time greats, and it frustrates me that he didn’t give himself the opportunity to play one last match today. Second, highlights from the 1999 Champions League final, United’s greatest triumph, in which Giggs assisted on Teddy Sheringham’s match-tying goal. Ferguson, Alex. My Autobiography. London: Hodder, 2013. I am a huge Manchester United fan, so of course I had to buy Sir Alex’s autobiography. It will be interesting to see what events from his 26-year reign at Old Trafford (not to mention his successful time at Aberdeen) stood out to him enough to write about. The book includes lots of photographs, which is also exciting. Morrison, Toni. Sula. 1973. New York: Vintage, 2004. This is a desk copy for my course on Teens and Twenty-somethings. I haven’t read Sula for about five years, and thus am very excited to interact with it again. People often view it as one of Morrison’s “easier” novels, but it is just as weird and disturbing as the others. I am currently reading John King’s 1996 novel The Football Factory about soccer fan culture and its causes in 1980s/early-1990s England. I also just read Sarah Lyall’s recent New York Times article about attending English soccer matches, which I found via one of my favorite soccer websites, When Saturday Comes. The contrast between the two pieces is striking. It is clear to any serious follower of the English game that Lyall’s piece is written by a rank outsider (which is, admittedly, in part the point, as she assumes that most of her readers will also be outsiders), and thus contains some major flaws. Aside from a smattering of factual errors (e.g., that the famous meat pies served at matches are traditionally filled with chicken rather than red meat, usually beef), there is no attempt to actually understand the culture. Instead, the article highlights its idiosyncrasies in order to demean them and the culture as a whole. It is an example of disgustingly U.S.-centric reporting. The article is flawed in its depiction of sports fandom in general, not just soccer fandom. The usual elitist attitude toward sports that is shared by way too many otherwise rational intellectuals (i.e., the sentiment “Why waste time caring about sports? It’s just a game.” In contrast, the reason I love When Saturday Comes is that it shows that a love of sports and a life of the mind can coexist.) is present throughout the piece. For example, Lyall is puzzled by the fact that English fans often seem miserable when watching their team, but this is the case with the majority of serious fans of any sport, including Americans. It is difficult to watch a team that you desperately care about for a multitude of reasons (not just whether they win or lose) play even if they are often successful (like my beloved Manchester United) and you expect them to win. Once you understand the nuances of a sport, it is difficult not to focus on the flaws inherent in the way it is played. That doesn’t mean that the glorious moments of beauty and triumph aren’t enjoyable, but that the knowledge that they are rare leads to a sort of resigned pessimism. Unlike the article, The Football Factory endeavors to show how soccer fandom fits within its broader societal context. The book is especially trenchant in its portrayal of how the Thatcher government’s policies destroyed the working and middle classes, and how responses to this calamity manifested themselves in soccer fandom. The novel does not celebrate troubling elements of fandom such as hooliganism, but it does offer a genuine attempt to understand them. Lyall’s article fails in this regard. It views fandom in a vacuum instead of considering how issues of class, race, and gender intersect with it.